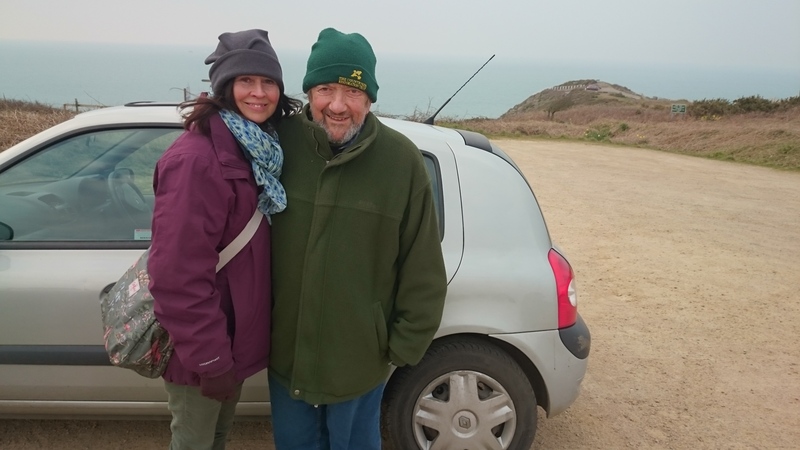 A recent collaboration between Jersey Trees for Life and Birds On The Edge has seen a new hedge planted at an important conservation site in St Ouen’s Bay. The new hedge, approximately 200m long, was planted at the edge of the National Trust for Jersey land and the Site of Special Interest of St Ouen’s Pond (SSI La Mare au Seigneur). The boundary lies between the Trust’s grazed pastures east of the reedbeds, and privately farmed fields west of the Rue du Val de la Mare. The potential value of creating a hedge in this area was identified during recent habitat and wildlife surveys carried out by BOTE, as part of a larger group of actions to enhance opportunities for wild birds in the area which were recommended as a result of the surveys. Other actions that were suggested included the planting of winter bird crops and setting up farmland feeding stations. A few months ago the local charity Jersey Trees for Life got in contact with BOTE to find a location for a new hedge project in St Ouen’s Bay, for which they already had possible sponsors, and this location was suggested. After obtaining permissions from NTJ and other landowners, the staff of JTFL proceeded to plant a total of 606 hedging whips. The bulk of the plants was comprised mainly of hawthorn, with some blackthorn, wild plum, grey sallow and a few shrubby aspen in as well. They were planted in double and triple rows over on the top of the wide existing bank, and the hedge was completed by mid-March. It is hoped that the particular placement of this hedge will connect various habitats of importance to birds, especially the reedbeds near the pond that extend to one side of the grazed area, and the arable fields on the other side of it, which most crucially are planted every year with Winter Bird Crops. 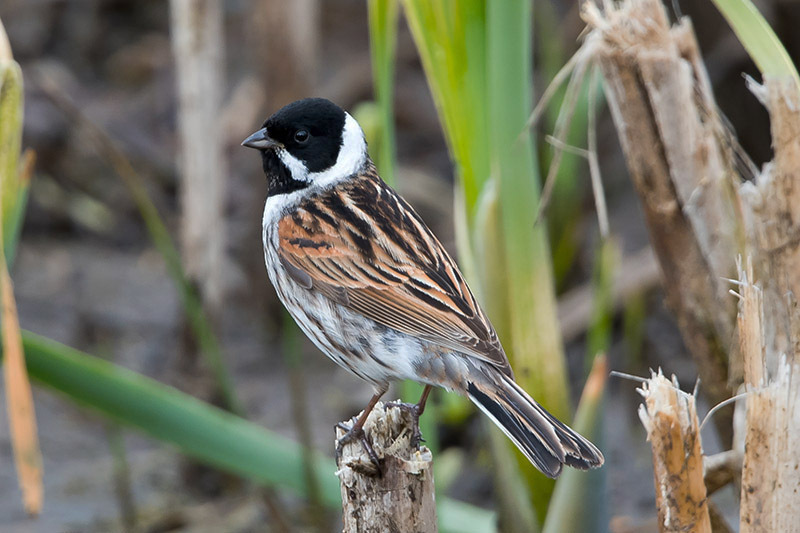 Many birds have been found in these crops during winter surveys, in particular the locally extinct (as a breeding bird) reed bunting, which now only winters in Jersey with a population of 200-400 birds, mainly in St Ouen’s Bay. 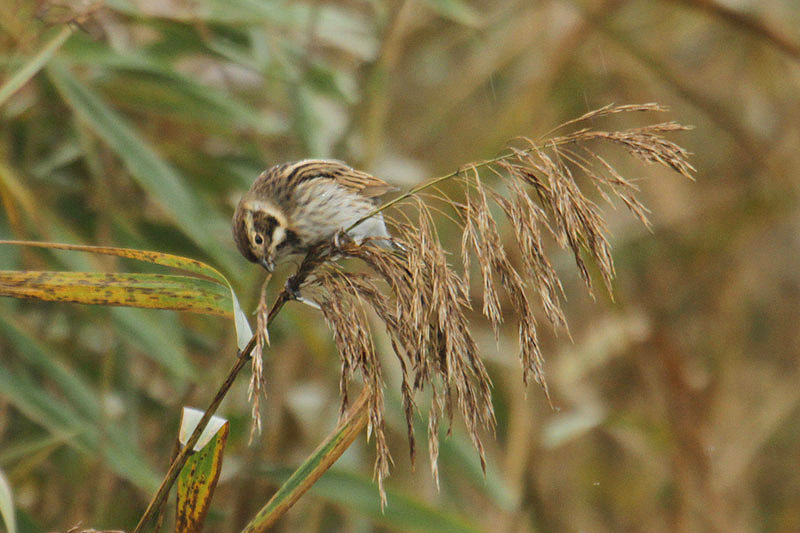 These buntings roost at night in the reedbeds and travel across the Island during the day to feed on small seeds from weeds, crops and marginal vegetation at small and spread-out sites. They do not like to feed on open ground like linnets nor are tame enough to visit garden feeders, but they have found a great source of food in the Winter Bird Crops managed by BOTE, especially the ones near the pond. However, to get to these fields from the safety of the reeds they still have to cross a large expanse of open ground, namely grassland and pastures. It is hoped that this hedge will provide them with a safety corridor to use not only for travelling between the roosting and feeding areas but also with shelter from predators and adverse weather, allowing them to remain in the feeding area for longer periods at a time. Many other birds can potentially benefit from this hedge, as it can also provide nesting habitat and a varied source of food (in the form of buds, berries and insects). Greenfinches, chaffinches, linnets, stonechats, Dartford warblers, starlings and many more are likely to benefit from this hedge and the other habitats and features that the hedge will make accessible to them. Other wildlife that will probably use it too includes green lizards, grass snakes, rodents and shrews, toads, numerous insects and other invertebrates. The future looks good for this area, as there is already an agreement with the local farmers to plant more Winter Bird Crops in 2016 for next winter, and further good news also from Jersey Trees for Life, as they plan to extend the hedge next winter following the same boundary southwards. From our side at Bird On The Edge, we will continue to monitor the birds using the crops and the hedge, and we hope that the data collected over the next few years will reflect the improvements on this area promoted by the bird crops and the newly planted hedge, especially as it develops and reaches full maturity. *This project has been possible thanks to a very positive collaboration between the local farmers, landowners, JTFL and the BOTE partnership. The breeding season got underway this month with both birds and staff busy nest building. 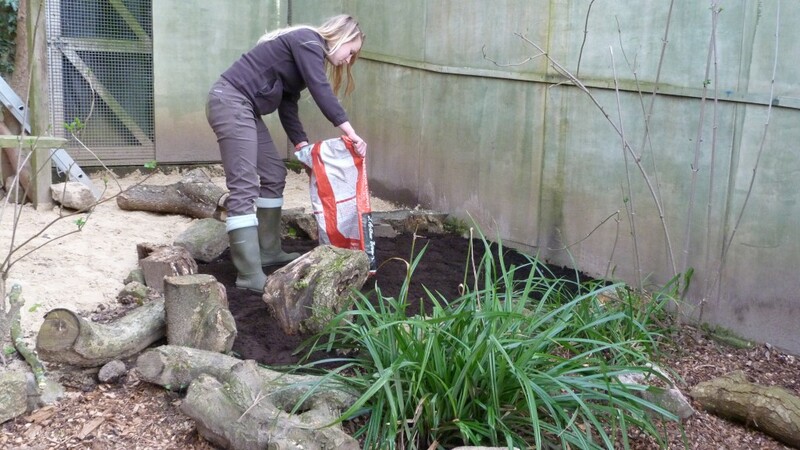 For Durrell staff at the Wildlife Park, work actually began back in February. The breeding aviaries needed a spring clean, fresh perching, and the nest cameras turning on before the pairs could be moved from their flocking aviary on public display to their individual breeding aviaries. 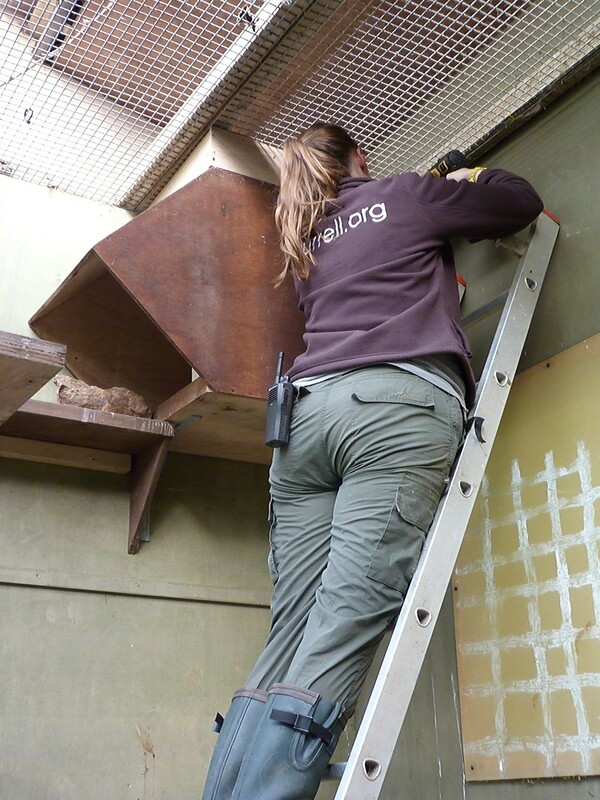 Keeper Jess Maxwell securing the nest box in one of the off-show breeding aviaries. Photo by Kathryn Smith. Keeper Jess Maxwell switching on the nest camera recording equipment for the 2016 season. Photo by Kathryn Smith. Two of the breeding aviaries are off-show. 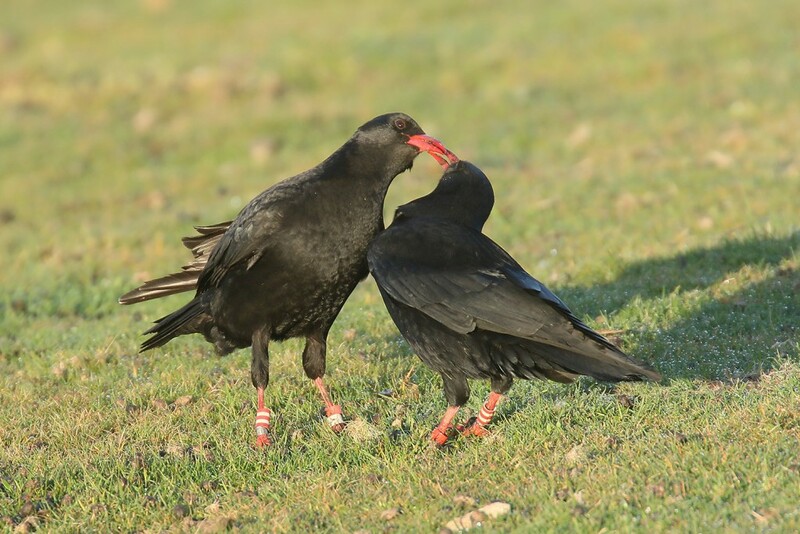 Their positioning and foundations make it very difficult to get grass to grow providing natural foraging habitat for the choughs and their chicks to develop natural skills. To compensate for this, various substrates are added such as bark chip and compost. Logs and rocks are strategically placed around the floor and on the shelves. Keeper, Kathryn Smith, adding substrate to the breeding aviaries. Photo by Jess Maxwell. These serve a dual purpose. Staff can hide insects in or under them to encourage natural foraging and the hard surface edges allow the birds to clean their bills after feeding. The abrasion from rubbing the bill also prevents the mandibles from becoming overgrown. 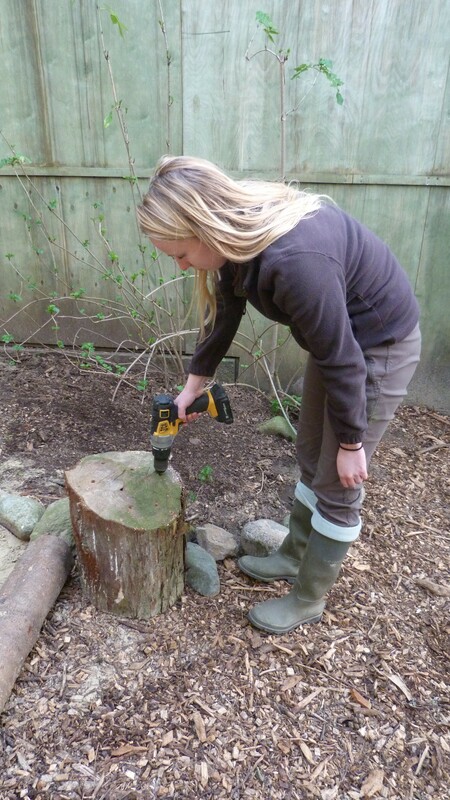 Keeper, Kathryn Smith, drilling holes into logs to hide mealworms in for the choughs. Photo by Jess Maxwell. In the short video clip below you can see Gianna demonstrating one of the ways we keep the choughs active. There are three potential pairs this year. The flocking aviary will become a breeding aviary between March and July for the third pair. If the choughs take to nesting in here, keepers will have to monitor disturbance levels and manage accordingly as this is on-show to the public. Having already lived in the aviary over the winter the pair will hopefully be accustomed to people walking past and won’t feel threatened. 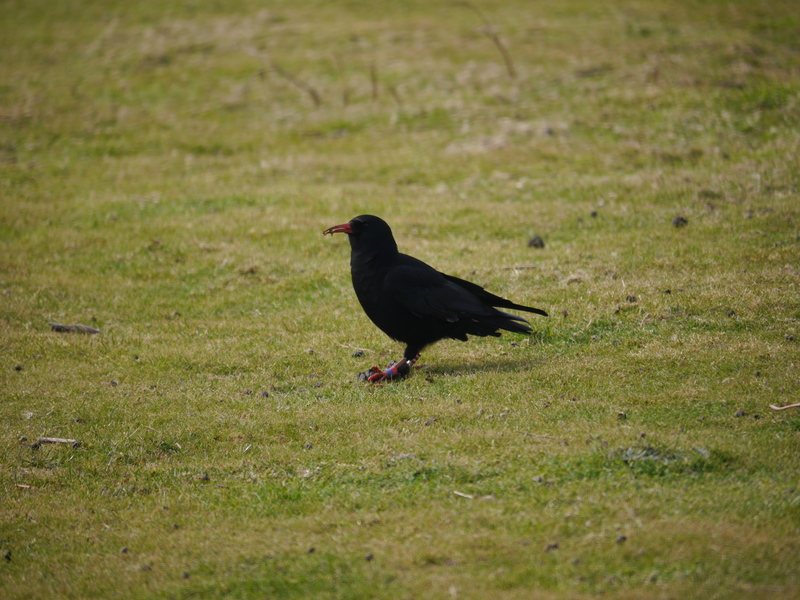 We don’t pick the pairs, the choughs do that for us. Their choices are limited as we only have six birds in the breeding programme. 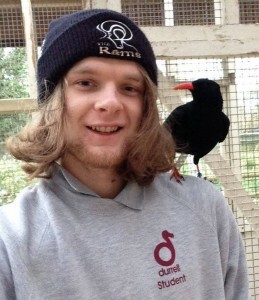 Tom Lancashire, a Nottingham Trent University student undertaking a twelve-month work placement at Durrell, conducted a behavioural study of our choughs as part of his Zoo Biology degree. 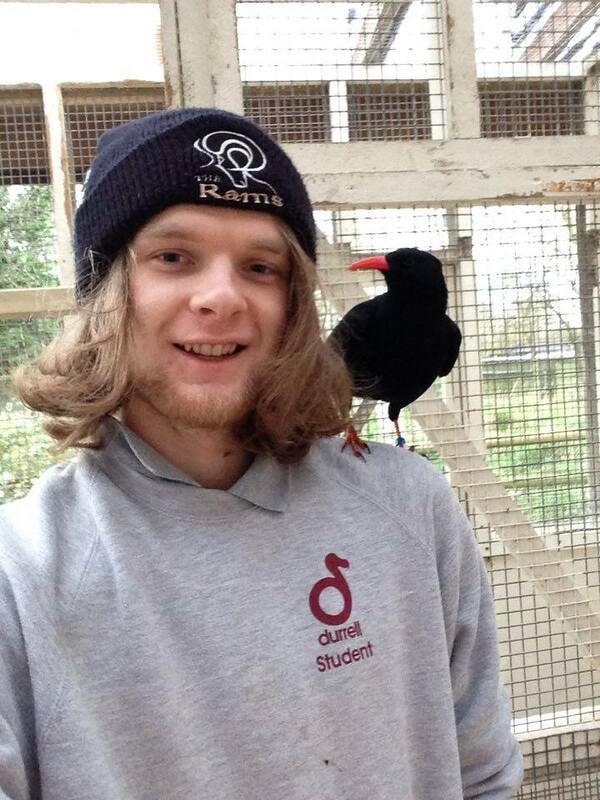 Student Tom Lancashire studied the social relationships amongst our captive choughs to determine breeding pairs. It appears Cece our hand reared bird made her own observations. Cece has since moved from Durrell to live at Paradise Park. Photo by Tom Lancashire. His observations showed that Issy and Tristan have once again paired up. They are very defensive over the food dishes in the flocking aviary and make sure they get to the food first. They probably view the aviary as their territory and tolerate the others being there outside of the breeding season. For this reason they will have the flocking aviary as their breeding aviary. True to their legendary namesakes their relationship has been a turbulent one. That being said they have both had nests before which have seen chicks hatch, but not survived to fledge. Hopefully 2016 will be their year! 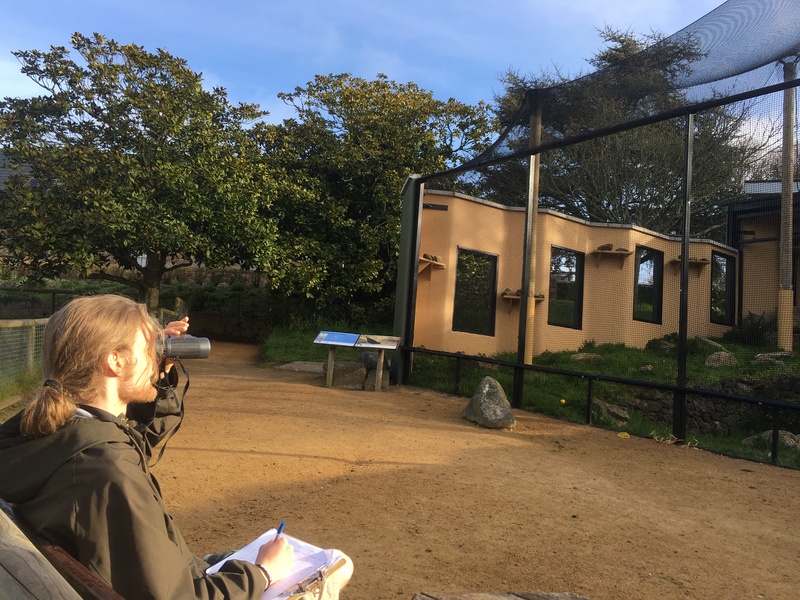 Tom Lancashire studying social interactions within the choughs at Durrell. Photo by Edward Bell. Gwinny is still with her young male friend who Tom named ‘Lucifer’ on account of his black leg ring and tendency to throw eggs out of nests. Admittedly it doesn’t sound like a promising pair. We are hoping that Lucifer may change his ways this year as he matures and becomes more familiar with the concept of parental care. Denzel and his (unnamed as yet) female also appear to be a pairing albeit by default. He was put with her when he came out of quarantine on arriving at Durrell last year. He still sticks by her in the flocking aviary and they have been seen to preen each other. We will have to wait and see whether or not this relationship blossoms. The pairs were moved into their breeding aviaries at the start of March after a few delays. Keepers provided nesting material and watched to see what would happen. Issy and Tristan were first off the mark carrying twigs to their nest box. Gwinny has also been quite active. Alas Lucifer has been equally active in removing the twigs! The other important chough at Durrell doing its part for the breeding programme is of course Gianna. We hope to use her as a foster parent again this year. This means she is given her own aviary complete with nest-box and nesting material. It’s probably her favourite time of year as she gets pampered by the keeper trying to convince her she has a partner who can provide whilst she is on the nest. The keeper also needs to ensure she goes through all the right steps at the right time. We need her to be in sync with the breeding pairs in case we need to rescue eggs or chicks from their nest and give them to Gianna to care for. The video below shows just how excited Gianna was when she saw the nest-box for the first time. 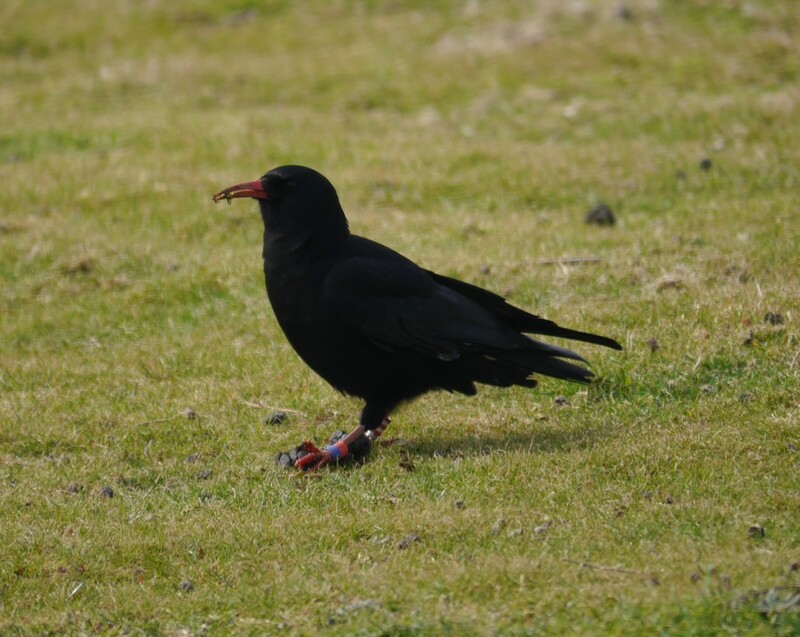 Choughs in the wild will make similar calls and collect similar nesting material. The only difference is that the keepers disinfect the wool and twigs as a precaution before adding them to the aviary; the wild ones throw caution to the wind. The pairs at Sorel had us all second-guessing with their nesting activity. 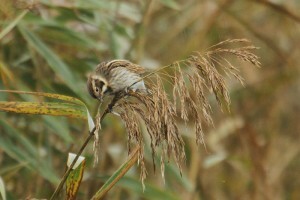 On 29th February White was spotted taking a twig to one of the cliff nest-boxes closely followed by Mauve. He also had most of the juveniles hanging around the site. We observed the group until the birds went to roost, but did not see any other signs of nesting activity. In fact nothing else was observed for a few weeks. Conspiracy theories abounded. Why were they not carrying twigs around? Had they given up because of all the rain? Last year they didn’t start until mid-March. Was White simply too quick off the mark? Were they sneaking materials out of the quarry behind our backs and binoculars? By the end of the month we had our answer. 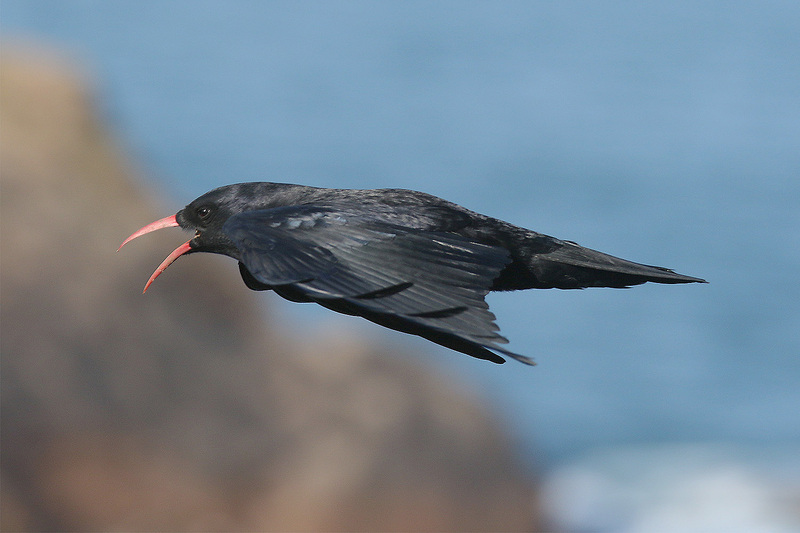 On the 25th a lone chough was spotted flying with a gorse twig in its bill. A few days later wool was flying back and forth. So no, they had not given up. Although yes, White was probably a bit eager. And yes, they probably did sneak materials from the quarry as the jump from twig stage to wool lining does not happen in three days. The juveniles continue with their objectives; eat, play, eat some more, sleep. As the weather improves food availability will improve. Warm sheep poo being a favourite source of grubs for some. 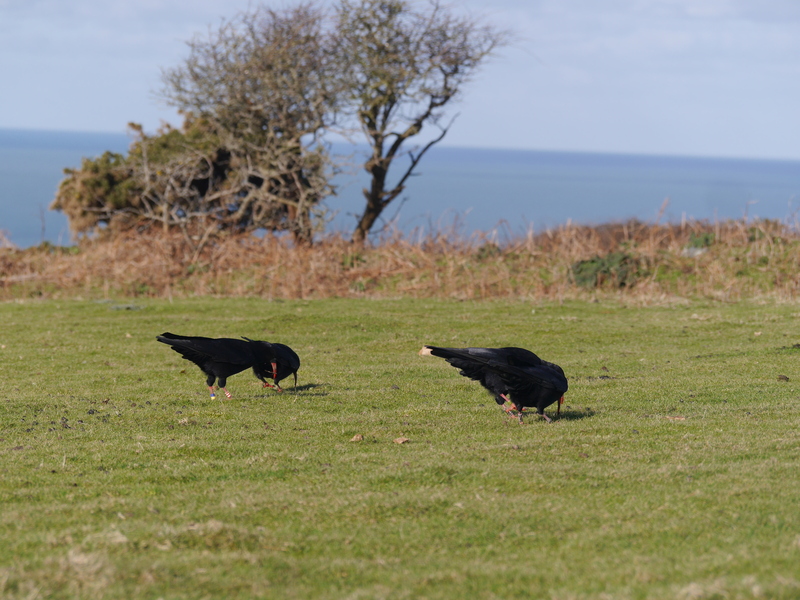 For two particular choughs change is afoot. We have a couple of ‘buddy’ pairs. Females Flieur and Helier look after each other. Kevin and Lee‘s clutch-mate ‘bromance’ continues. Then, headline news, the pair which currently holds the award for ‘cutest couple’ is none other than Dusty the wild-hatched chick and Egg a two-year-old female. We will be watching them very closely over the next few months. 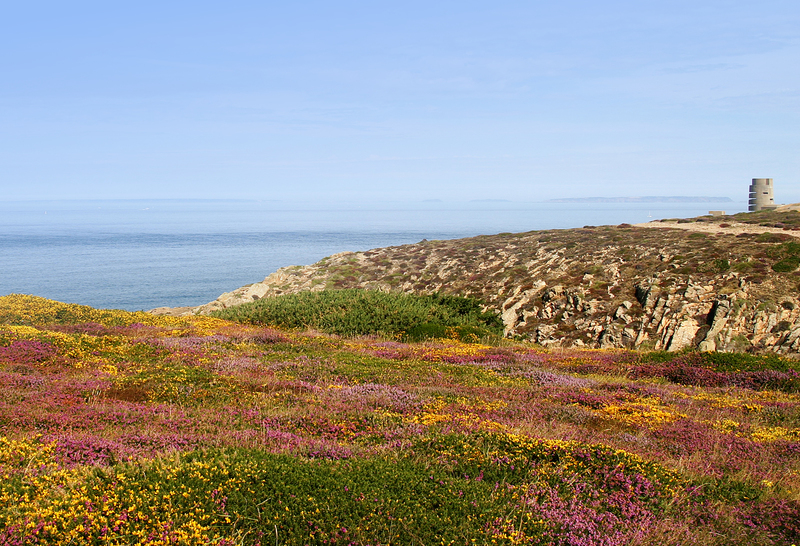 At Sorel we often receive visitors as the project is not only very popular in Jersey but increasingly it is becoming a showcase for reintroduction of a native bird and co-operation between partners and landowners and users to help restore our countryside. 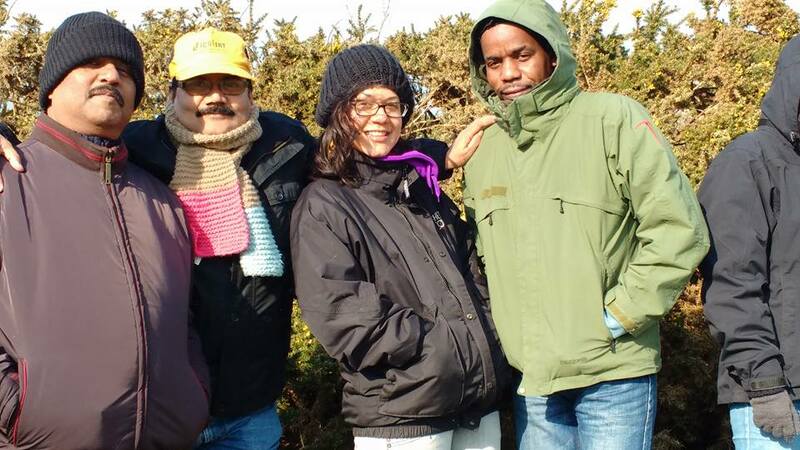 This month we hosted international students from Durrell Academy’s DESMAN course and students from Nottingham Trent University’s MSc in Endangered Species Recovery course under the guidance of Samantha Bremner-Harrison. 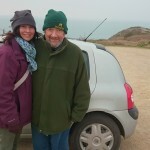 On the 18th we introduced countryside journalist Robin Page and his wife Lulu to the project. Luckily the choughs put in suitably spectacular appearances on each occasion despite the obviously lees than pleasant weather.